One upon a time, there was a shiny pendant, made of shiny gold, and shiny diamonds. He lived a simple, quiet, happy life in Ohio with its friend Maverick. "I sure do love my simple, quiet, happy life with you," Pendant told Maverick. "Promise me we'll be together always?" "I promise," Maverick told it. "You will always be my favorite." But things changed. 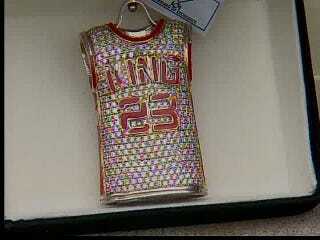 Because of some person named LeBron, who the pendant had a vague idea had something to do with him, Maverick changed. No longer would he take Pendant for walks in the park, or drive up to the lake to watch the sun set. Now Maverick spent all of his time in meetings, or traveling, leaving the pendant all alone. Even worse, the pendant was no longer Maverick's only shiny friend. Now he had all kinds of shiny rings, shiny pins, shiny necklaces, shiny earrings, shiny everything. He would go weeks without ever putting the pendant on! All the while the pendant would sit in his small dark box, and think about the good times they had had together. "I know Maverick loves me!" he told himself. "He told me I was his favorite!" But things just got worse. He spent more and more time in his box, gradually losing his shine. Before, Maverick had cleaned him every day in a special bath. Now? He was lucky to get a quick rub with a rag. Pendant made up its mind to run away, to find someone who would love him again. But before he could do anything, he felt his box move! He was moving! Where was he going? Maverick had always told Pendant what a big world it was out there; maybe he was taking him to see it all? Was he Maverick's favorite again? The box opened, and Pendant got ready to see where he had gone. But who was that? That wasn't Maverick! It was some lady, and he was far from home. The lady said her name was Vaneisha, and that he was going to live with her from now on, and that he would always be her favorite. For the pendant, that was all he ever wanted to hear. The years passed. Pendant was happy with his new friend Vaneisha, but, late at night, when all was quiet, he had to admit a part of him still missed his first friend Maverick. "He'll come for me," Pendant told himself. "He said I would always be his favorite. Always..."
And with that, Pendant would drift off to sleep, to have wonderful dreams of dangling from Maverick's neck. Then one day, the men with cameras came. They said they were from Channel 5, in the Big City. They took all these pictures of Pendant, like he was famous! They asked how Pendant and Vaneisha first met. But before Pendant could answer, Vaneisha told them a story. Pendant couldn't believe what he was hearing. Vaneisha told the men she had bought him at a yard sale for five dollars, gotten him appraised, and was now selling him for lots and lots of dollars. Selling him? Pendant didn't want to be sold! He just wanted to be with his friend. Perhaps he had misheard. After all, he thought, Vaneisha can't possibly expect people to believe someone forgot that they had a $10,000 pendant and sold it at a yard sale. And how dumb would someone have to be to believe that she would pay hundreds of dollars for a jewelry appraisal for something she thought was worth $5? But he hadn't misheard. She was lying to the men from the Big City, and was going to sell him. Pendant didn't want to be sold. He had thought Vaneisha was his friend, but a true friend would never sell you out. Oh, where was Maverick? He would save Pendant! If only Maverick knew where he was. He went to the men from Channel 5 and asked them to tell Maverick what was happening. They promised to tell not only Maverick, but everyone in the whole North-Central Ohio viewing area! And they did. Sure enough, Maverick heard what the men from Channel 5 said. He called Pendant. "Pendant! I want you back!" he cried. "I'm sorry I ever let you go!" Pendant was filled with happiness inside. He had known it all along; he was still Maverick's favorite. But now they had to figure out how to get back together. Luckily, Pendant had seen on TV someone called OJ Simpson. OJ Simpson had lots of his friends taken away from him, so OJ Simpson rounded up some large men, and went to a hotel room in Las Vegas, and got all his friends back. Surely it would work for him and Maverick! He told Maverick his idea. Maverick told him that was the smartest thing he'd ever heard anyone say. Pendant blushed so much, his 307 near colorless diamonds looked more like rubies. Maverick called Vaneisha and had her come over. There some large men made sure she gave Pendant back to Maverick, and then left. As she walked away, Pendant thought about Vaneisha. She hadn't really been that bad to him. Hadn't she always kept him clean, and shown him off to all her other friends? Pendant decided that Vaneisha wasn't really a mean person; she had just been lonely. But he had Maverick back! As the hugged, and Maverick put Pendant around his neck, Pendant looked up at his first friend, his best friend. "Did you miss me, Maverick?" he asked. "Oh, Pendant," Maverick chuckled. "More than anything. Like I told you, you will always be my favorite." And Pendant went back to his simple, quiet, happy life.